Heavenly Father, we trust Your Word which says that praying for those in authority over us brings blessing and well-being to our lives. We now lift up to your throne of grace MPP Jamie West, thanking You for his life and leadership; may you grant him grace and wisdom for his parliamentary role. We pray that his efforts and endeavours would result in an abundance and variety of blessing for both him and his family, as well as for the riding of Sudbury. Thank You for this, in Jesus’ name. Amen. Born and raised in Sudbury, Jamie has devoted himself to working on issues that affect families in the community, like health care, and opposing the privatization of Hydro One. He’s a certified Worker Safety Representative at Vale and president of the Sudbury & District Labour Council. He teaches at Laurentian University, and graduated from both Laurentian and Cambrian College. Jamie believes in giving back through volunteerism, and serves as a United Way Board Member. Thank You sweet Lord Jesus for the life of MPP Prabmeet Sarkaria. You have been so good and gracious to Prabmeet and to his family…. 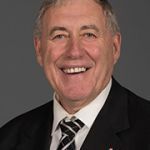 Heavenly Father, thank You for the gift of Daryl Kramp to the people of Ontario and especially for the experience he brings as a Parliamentarian….